Suppose that in 2014 a new libertarian party gets seats in New Zealand’s Parliament and becomes a coalition partner in government. Suppose that, as part of a coalition agreement, the new party gets to implement its transitional welfare policy. There’s to be a cap on the total number of beneficiaries! Benefits across the board are to be slashed by 10% per year! At the end of the first year, total welfare spending has increased! Far from being part of a balanced budget, welfare spending is even more out of whack! The Law of Unintended Consequences has reared its ugly head, again. Although the total number of beneficiaries hasn’t increased, and all benefits pay 10% less than they did, the new Invalids Benefit still pays substantially more than the old Unemployment Benefit. Beneficiaries have proved themselves able to move to not find work. There are now less unemployed and more invalids. This particular case of the Law of Unintended Consequences has a name, viz., Simpson’s Paradox. One of the best known real life examples of Simpson’s paradox occurred when the University of California, Berkeley was sued for bias against women who had applied for admission to graduate schools there. The admission figures for the fall of 1973 showed that men applying were more likely than women to be admitted, and the difference was so large that it was unlikely to be due to chance. The research paper by Bickel, et al. concluded that women tended to apply to competitive departments with low rates of admission even among qualified applicants (such as in the English Department), whereas men tended to apply to less-competitive departments with high rates of admission among the qualified applicants (such as in engineering and chemistry). The conditions under which the admissions’ frequency data from specific departments constitute a proper defense against charges of discrimination are formulated in the book Causality by Pearl. In any event, nothing is more important in the short term than ejecting The Filth from the White House, even if that means voting for Milksop Mitt. 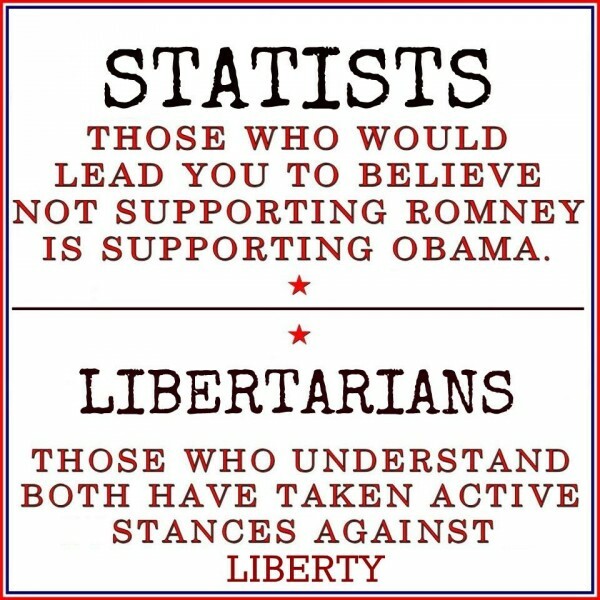 Certainly, a vote for some Saddamite masquerading as a libertarian [i.e., Gary Johnson] is just another vote for Obamarx. To think this way is to make a tragic mistake. Sure, the lesser evil is lesser. 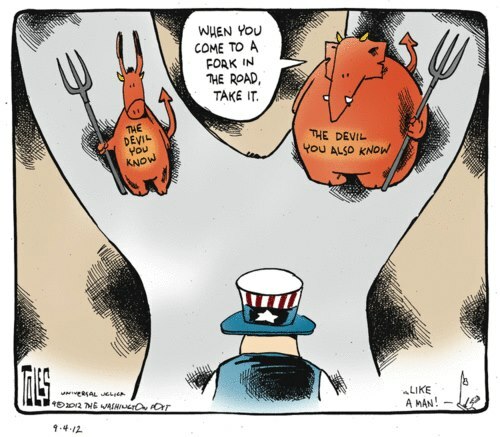 But the lesser evil is also evil, and no long-term good will come of voting for it. It works something like this. When Clark beat Shipley in 1999, Clark was the lesser evil. When Key beat Clark in 2008, Key was the lesser evil. But Clark in 2008 was more evil than Shipley in 1999. And Key in 2014 (or 2017) will be more evil than Clark in 2008. By voting consistently for the lesser of two evils, one is consistently voting for evil. One is ratcheting evil. Or, when Bush beat Clinton in 2000, Bush was the lesser evil. 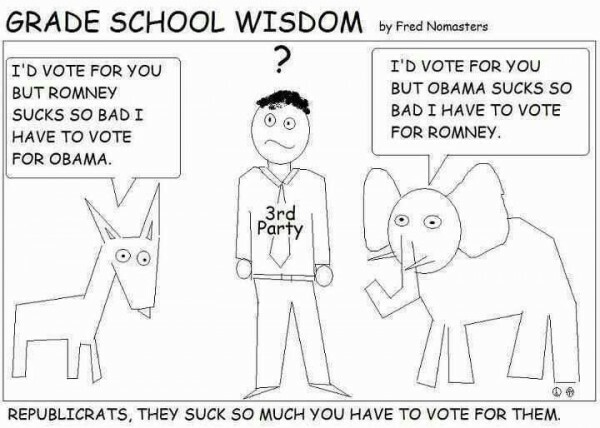 When Obama beat Bush in 2008, Obama was the lesser evil. But Bush in 2008 was more evil than Clinton in 2000. Obama in 2012 is more evil than Bush in 2008. And Romney as POTUS in 2016 (or 2020) will be more evil than Obama in 2012. 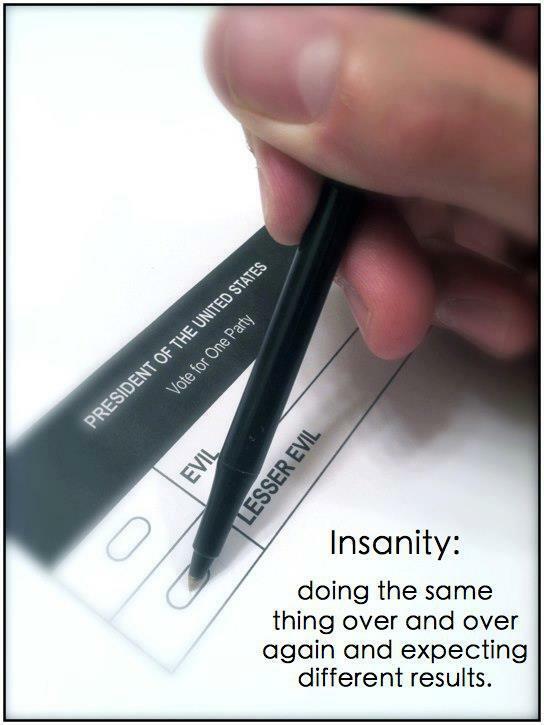 By voting consistently for the lesser of two evils, one is consistently voting for evil. One is ratcheting evil. The natural progress of things is for tyrants to become more tyrannical the longer they remain in office. The more tyrannical they are to begin with, the more quickly they become more tyrannical. As yet our spirits are free, but to put a stop to this ratcheting evil, we need to use our precious suffrage to vote for, only to vote for, and one of these fine days to vote in, politicians of principle. They’re as rare as hens’ teeth, of course, but they do exist—on this very blog! WTFU, people! 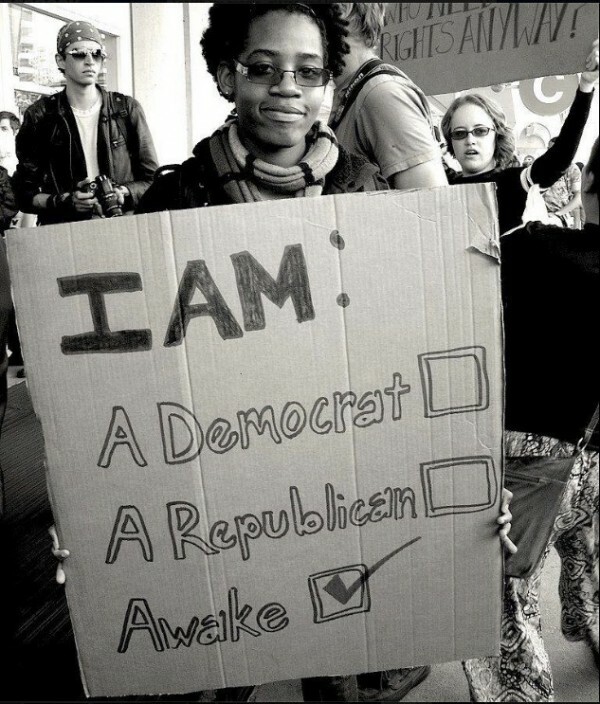 A vote for the lesser of two evils is a vote for EVIL. What are you, criminally insane? Please go take this cure for your moral and mental sickness! Previous PostSide Show Carnies : Socialist vs Socialist. The Auckland Housing Crisis.Next PostAre you living in a computer game? Nice post, Richard. Love the opening quotation. Firstly, as a matter of simple historical fact, Bush did not beat Clinton in 2000, and Obama did not beat Bush in 2008. Bush beat Gore in 2000, and Obama beat McCain in 2008. I see the theoretical argument, but I think it’s no more correct than the above as obviously it relies on endlessly declining candidates, or at least sufficiently emotive Libertarian rhetoric to make them appear that way. Let’s set a value of the Perfectly Virtuous Candidate at 1, and the Ultimate Evil Candidate at 0. Let’s say in 2000 we had Party A Candidate who rates a 0.6 (ie is 40%) evil, and a Party B Candidate who rates a 0.2 (is 80% evil). 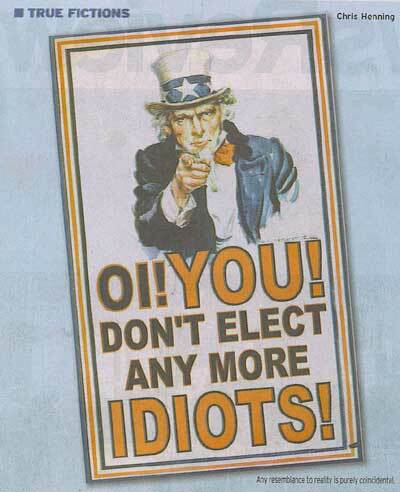 We vote for the lesser evil, ie candidate A. Then in 2004, that year’s Party A, complacent in power, puts forward a candidate that rates a 0.5 (50% evil), whereas Party B, energised in defeat, puts forward a candidate that is a 0.7 (30%). We vote for the lesser evil, and we now have a candidate that is less evil than the previous two. So this “ratchet” effect doesn’t necessarily occur at all. The problem for libertarians is that if government is evil, and they want to govern, they will have to be evil themselves. Hopefully of a lesser variety. 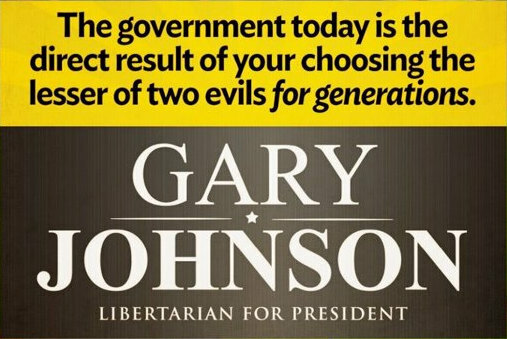 I don’t think that Johnson is a lesser evil, just a rethuglican who lost and re-branded as a libertarian. His actual record as governor wouldn’t give you much reason to vote for him. Daniel, why let a matter of simple historical fact get in the way of a good story?! I had overlooked the fact that the U.S. has term limits. But the fact reinforces my point. Why does the U.S. have term limits? Because they have “endlessly declining candidates.” Power corrupts and absolute power corrupts absolutely – and three terms is one too many. NSFE. Let’s say … So this “ratchet” effect doesn’t necessarily occur at all. Anarchists think that government is evil. Libertarians think that there’s no government like no government—unless it’s very, very small. Why drive out to your polling place and stand in line for half an hour or more – when your vote isn’t very likely to singlehandedly determine the Presidency – and then vote for someone you don’t even want? 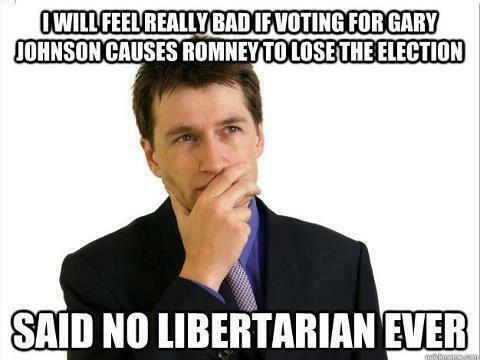 What evil would Romney do? What evil would Romney have done that’s not being done already?